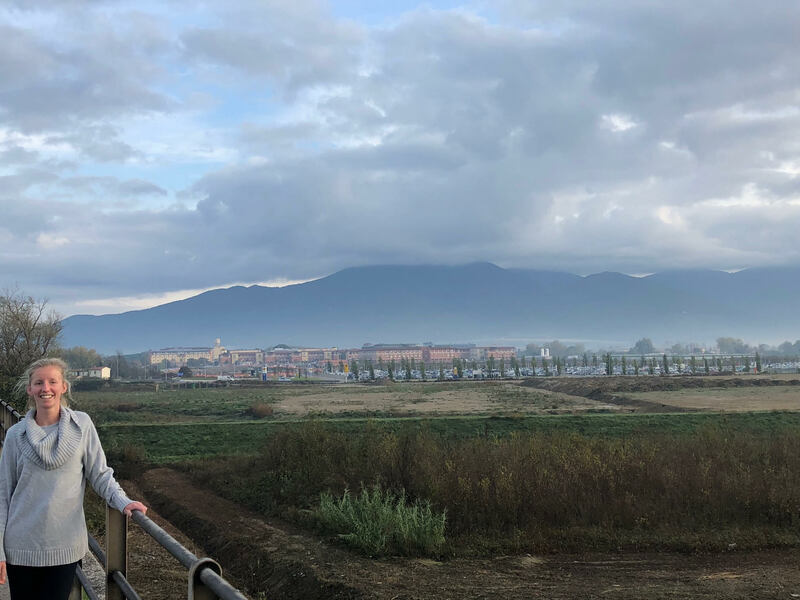 As I hung up my white coat for the last time, I reflected on all the great memories of my 5 weeks in the radiodiagnostic department in Pisa, Italy. 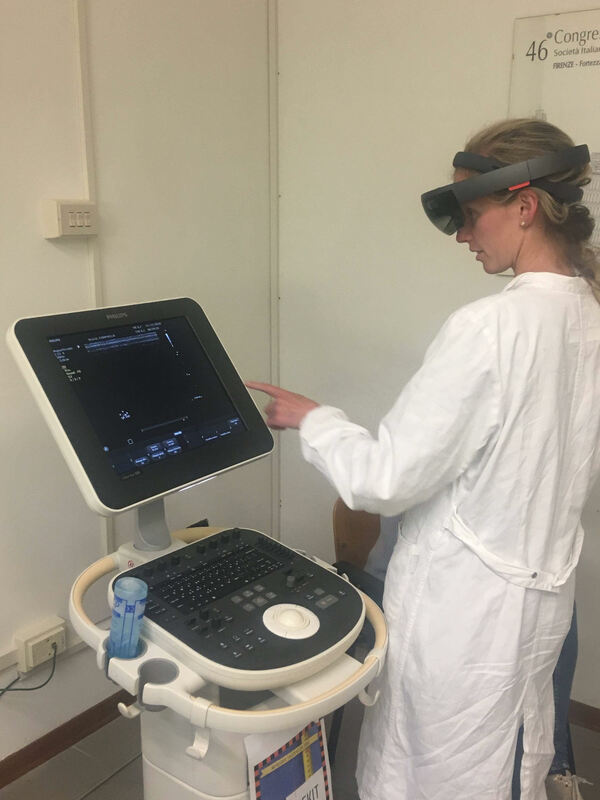 One particular stand out was being able to trial a new technology in radiodiagnostics utilising virtual reality technology, with the goal to improve the skills of doctors using ultrasound. Practising using Virtual Reality via the Microsoft Halolens. This is marketed by a company called Wekit (website: wekit.eu), which is funded by the European Union, which has a goal to enhance the use of technology in different industries, including medicine. The aim of the ultrasound technology is to allow a doctor without any experience in ultrasound to become an ‘expert’ in order to serve the best on-the-spot-care to the patient. 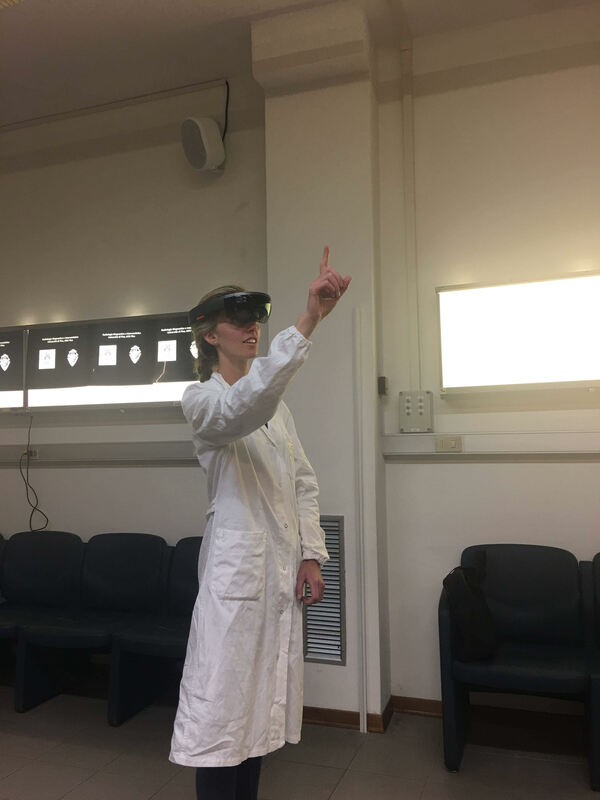 The virtual reality technology uses the Microsoft HaloLens to produce a 3D image to be seen only be the wearer, and this image can be interacted with using hand gestures. The Halolens gives visual and auditory instructions, as well as interactive images, of what should be seen on the ultrasound monitor as the doctor assesses the patient. The intention is for the doctor to produce an image on the ultrasound monitor that is similar to the virtual 3D image, and then use that ultrasound image to look for pathology in the patient. Applying the virtual reality Halolens to perform an ultrasound examination of a patient’s submandibular glands. This technology has the intention of improving efficiency in hospitals and allowing care to be provided to the patients immediately, without the need for waiting on specialists or those highly trained in Ultrasound. Furthermore, it provides on-the-job training in ultrasound via the ‘virtual’ instructions. I am by no means a technology expert, however I found it to be highly user-friendly, despite never having used virtual reality technology. During my trial I used it to look at the submandibular gland of patients, something that I also had no experience in, and I felt confident to be able to complete the task of analysing the submandibular glands with the aid of the Halolens*. This technology could also be very useful in rural areas of New Zealand which are under-resourced with specialist doctors. It could allow rural doctors to carry out investigations or even interventions without the need for the patients to travel to larger centres. Using the virtual reality was thrilling and it excited me for what further technology will be brought into medicine to enhance our skills and improve our treatment of patients. My daily walk to the hospital through the countryside of Pisa. Overall, my experience in Italy has been about learning some of the important principles of medicine; such as, ensuring I am wise in the interventions and treatment I deliver to my patients, and dealing with frustration when a diagnosis or cure cannot be found. I am sure my time in the Emergency department of Peru will be extremely different and filled with its own distinct challenges, and I am excited for the contrast. No more white coat and Italian shoes; only scrubs and sneakers for the next 6 weeks! *Disclaimer: I am not endorsed by Wikit; I am simply a satisfied consumer of their product.